This area is open to all visitors; a place for people to come and reflect on Peace whenever they would like to. 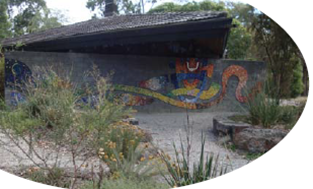 People can often be seen wandering by the wall and around the pathways in the garden and children delight in finding their tile in the design. Visitors often write a prayer or message for Peace which is then planted in the garden. The wall was created with the help of over 1,000 community members. The participants came from many different faiths, many different community groups and were people aged between 2 and 92! Each participant made or painted a tile which represented Peace to them. School children concentrated on Peace with the Earth and made animals, fish, plants, insects & stars. The tiles were then placed as mosaics into a design created by professional artists in our congregation, Walter Magilton and Denise Keele-Bedford. Mary-Lou & Chris Pittard were ceramic artists who guided the process and ran workshops and Mandy Nicholson is a Wurundjeri artist who shared the stories and symbols of the Wurundjeri people and gave permission for these symbols to be used in our Peace area. We used only local indigenous plants, returning the area to its natural state and preserved the native grasses which were already there. Water run-off from the church roof is used in two ways. The first is a flat carved stone “font” which fills when it rains and spills onto the garden. We also purchased recycled olive drums to store run off from the gutters which serve as a watering system for the plants. The creation of our Peace wall and garden developed a strong and vibrant link to the community. We found we all cared deeply about Peace in all its forms and the participants appreciated the opportunity to share in creating this peace filled space. Our vision continues….. Our discussions on Peace have inspired us to pursue other opportunities to create Peace with our Earth.